aint Matthew’s Academy is a six-year denominational school created in 2007 to serve primarily, but not exclusively, the Catholic community of North Ayrshire. Its enrollment is approximately 1240 young people. The Headteacher is Mr Stephen Colligan. He is supported by 4 Depute Head Teachers. Mr McGuigan is Head of S2 and S6. Mrs Schlesiger is Head of S3. Mr Herron is Head of S4 and Mr Ross is Head of S1 and S5. St Matthew’s Academy is a denominational school and, as such, we seek to be a centre of excellence providing the highest possible quality of education in a Catholic community where care, cooperation and mutual respect are at the centre of everything we do. We want to give all the members of our community the opportunity and encouragement to achieve their full potential. The state-of-the-art teaching facilities in St Matthew’s Academy include interactive whiteboard technology and pupil computers in every teaching area. Well-equipped staff bases are located within main teaching areas and there are tutorial rooms on each floor for individual and small group use. The school is also provided with extensive sports facilities (including a full-size synthetic pitch, an athletics track and a fitness suite), a 400-seat theatre/auditorium and a central social area for pupils. 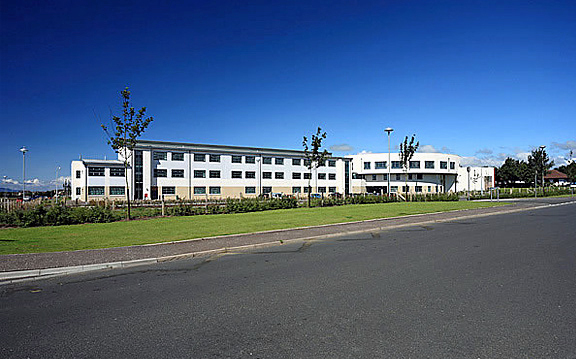 The roll of St Matthew’s Academy is drawn in the main from the ten cluster denominational primary schools located throughout North Ayrshire: St John Ogilvie’s and St Mark’s in Irvine; St Winning’s and St Luke’s in Kilwinning; St John’s in Stevenston; St Anthony’s in Saltcoats; St Peter’s in Ardrossan; St Mary’s in Largs; St Bridget’s in Kilbirnie; and St Palladius’ in Dalry. Pupils from all areas other than Ardrossan, Saltcoats and Stevenston travel to St Matthew’s Academy by contract bus. Around 10% of the First Year roll, however, comprises pupils from non-associated primary schools who have made successful placing requests into St Matthew’s. The proportion of S4 pupils returning for a Fifth Year in 2017-18 is around 85% with the S5 – S6 transfer rate being in the region of 70%. A number of twitter accounts are available which provide regular updates to all members of the community about the many events taking place in the school. You can access the main school account from the link on the left hand side of this page.